Looking for an affordable dentist in Parma? Whether you’re coming in with a dental emergency, have extensive work that you’ve been putting off, or simply have unexpected treatment needs, Dr. Rebecca Gecovich and the team at Parma Ridge Family Dental put quality care within reach. Affordable Rates: Dr. Gecovich doesn’t believe there is a need for high dental fees, and has tried to set her fees at a very reasonable level. In-Network: We’re in-network for most major PPO plans, which may qualify you for additional treatment discounts. We’ll also gladly bill your insurance company for services rendered so that you only need to pay your co-pay. Benefit Maximization: Our office staff will learn as much about your particular insurance plan as possible, so we can help you make the most of your benefits. At Parma Ridge Family Dental, personalized care for your entire family is the ultimate goal, with affordable dental services being a wonderful by-product of our process. Treatment Options: Dr. Gecovich will spend time getting to know your needs, goals, and wishes, so that treatment can be customized for you. Oftentimes, dental offices become so set on providing a single form of treatment that patients feel boxed into a specific solution, which may or may not be right for them. For example, while we may firmly believe a dental implant is the best solution overall for missing teeth, we also know it’s not the right choice for everyone. Certain health conditions and budgets may put something like this out of reach, and that’s okay. You deserve a full, healthy smile, and the doctor will propose alternate solutions, such as partial dentures and bridges, to help you achieve your goals while staying within your budget. Spreading Out Appointments: Our front office staff can help you spread out your appointments to stay within a budget or address issues one at a time to make treatment more affordable. Our patients with extensive dental needs tend to appreciate this the most because we break treatment up into “bite-sized” pieces that are easier to manage. Prevention: We find that by focusing on prevention and making dental care more affordable, people are better able to maintain their oral health, and their overall costs for care are lower. Credit Cards: We accept most major credit cards, including Visa, Master Card, and Discover Card, as well as payments made via cash, check, or money order. Payment Plans/ Financing: We understand that sometimes urgent dental needs arise when you least expect them to. 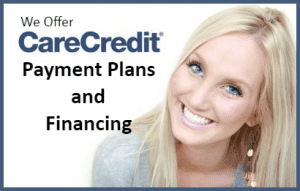 In order to accommodate greater dental needs on a budget, our office offers payment plans, including no-interest plans, through Care Credit. This is a special form of financing available exclusively for use in healthcare facilities. If you’re experiencing a dental emergency, please call our office at (440) 845-6420, and we’ll reserve our next available appointment for you. For all other inquiries, such consultations and cleanings, you may call us directly or request an appointment directly through our site.